It's crazy to think that 2016 is drawing to a close, 12 months seemed to go by so quickly. Its also crazy to think that it has almost been four weeks since Ironman Arizona. I know I probably use Ironman as a time piece but it was such a big part of 2016 its hard not to. While I never want to "wish" time away I am looking forward to all that my husband and I have planned for 2017. The "off season" its such a coveted season. The off season can be attributed to a lot of different things; from athletics to work. It is something we all talk about, longingly at some time points, often especially near the end of a long season. I was surprised at how well I bounced back physically from Ironman and within a week was back in the gym lifting and running. However, the thought of getting back on the bike and in the pool has taken me some time to get used to. Basically, for the last four weeks I've doing whatever it is that I want to do. If I want to run I do if not then I don't. I've slept in almost every day and I've taken more days off than I normally do (I'm usually a one day off every 14-21 days kind of person). I've really enjoyed having the extra time and the flexibility to do whatever I want. As I know that starting in early 2017 it will be time to hit it hard training wise we've been taking advantage the extra time and me not being as tired. 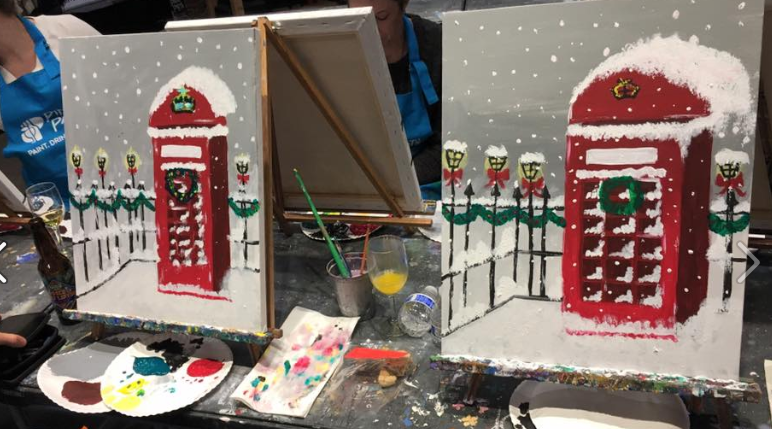 Date nights with the husband, family, and friends where we went to a paint night and then a dinner night to look at the Christmas trees in Spokane. We've taken the doodle dog on a couple of walks with the doodle. Just recently we got the doodle some booties to protect his feet from the snow as his feet were getting destroyed in the snow. He tried them on the other night for the first time and it was probably one of the funniest things I've ever seen in my life. Besides putting our doodle through hell, he pouted the rest of the night after we took the above video, at our benefit I've run a handful of times, done a lot of lifting, and started to think about getting back into the swing of things. This will allow me to start training with power which I hope to use to really improve my bike time. After Arizona I immediately made one of my goals to be able to replicate that bike split on any course, and I think that training with power can help me to do that. Now that the pain cave is complete it means I no longer have an excuse to delay getting back into it. I have had a hard time balancing the desire to take the month of December easy, which I have, with wanting to maintain my fitness to make the beginning of training season a little easier. I spent so much time last year starting from ground zero that I want to avoid that. However to do that you actually have to do the swim, bike, run thing and getting myself to do it has been hard. My race schedule is not finalized for 2017 yet but I have the skeleton of it set with Couer d'Alene 70.3 in June and Ironman Kona in October, which means that come January training starts over for me. As it is currently mid December I've decided to spend the next two weeks slowly getting myself into it with the goal of beginning base training in January. The plan is to do my first FTP come the first of January and use that as my starting point for base training. Training with power is new to me so I've been trying to figure out what to do with it. From now until then the goal is to get myself into the pool at least once a week, ride around two times a week, and run two to three times a week on top of the lifting that I am doing. I'm still finalizing 2017 between deciding what racing to do and figuring out my training plan for the season. The key for me is to figure out how to incorporate power training, I think I'm nailing it down, as this is newer for me to write into my plans. I'm excited to see what it can do for improving my bike splits. Besides that I'm enjoying the down time but starting to feel the pull of triathlon and more structured training, as I know most of us start to after a while. What's your favorite part of the off season? When do you start to feel the tug of racing or training again?